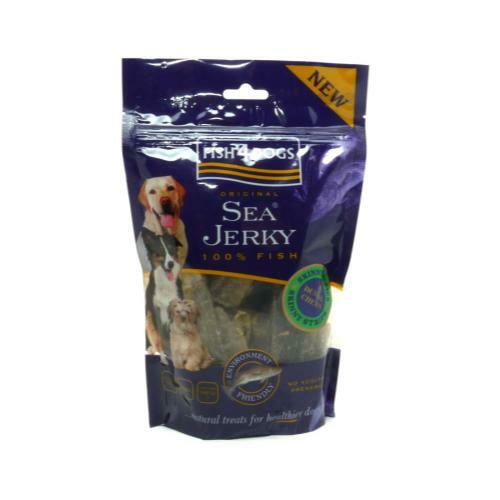 Fish 4 Dogs Sea Jerky Skinny Strips are a great dog treat made from 100% fish skins. These natural healthy treats have a rough texture which helps remove tartar from your dog’s teeth and Omega 3 and other fish oils to help promote a healthy coat and supple joints. Omega oils have been shown to improve concentration and temperament. This is the fish version of raw hide! Rather than chew, dogs crunch through these large dental treats that are comfortably held in the paws. Sea Jerky Skinny Strips are about 185mm long by 30mm wide and 7mm deep and ideal treats for larger dogs such as Labrador Retriever; Golden Retriever; Boxer; German Shepherd ; Staffordshire Bull Terrier; Alaskan Malamute; Akita. They are a complementary pet food for dogs.